Ten years ago my wife and I spotted deer in the woods below our house in Elora, for the first time ever. There was also a lot of noisy activity from the crows in the cedars, which seemed odd because it was still late winter. Nichola took both things as bad omens, because her 34-year-old sister was about to enter the hospital for surgery to remove … we weren’t sure what … a cyst, a shadow on an ultrasound, perhaps a tumour? But the omens were prophetic: Sarah’s surgery was major; they found pervasive cancer and removed her stomach. Soon after, she developed an infection that became flesh-eating disease. Three days after her surgery she died of sepsis in the Hamilton Health Sciences ICU. I’d never seen such grief as that which took over my wife, her brother and their parents. It upended our lives. An example: Sarah’s father Brian had been a post-retirement volunteer, first on the board of the local Fergus hospital, and then with the Ontario Hospital Association. So, in the middle of his term on the high-level body that governs the province’s vast network of hospitals, his daughter dies of – a hospital-acquired infection? Try to get your head around that. He resigned from the OHA. We attempted to make sense of Sarah’s ten-year journey from promising university grad, through mental illness, addictions, self-destructive behaviour – and then, that final, horrible weekend in Hamilton. It was impossible to untangle or accept, but it took us years to realize this. We moved to Guelph, in an attempt to escape … I’m not sure what … memories? voices? patterns of behaviour? or just to shake up our lives? Ten years is a long time – and it’s the blink of an eye. The cliché says, “time heals all wounds”, but it’s not that simple. Your whole worldview changes, you’re reluctantly forced to acknowledge there are things you’ll never know or understand, and you gradually adjust to this new skin you had to grow after the old one was suddenly torn away. But the memories of Sarah are as strong as ever – especially her laugh, her energy, her smile, her white-hot intensity, her drama and personal charisma. 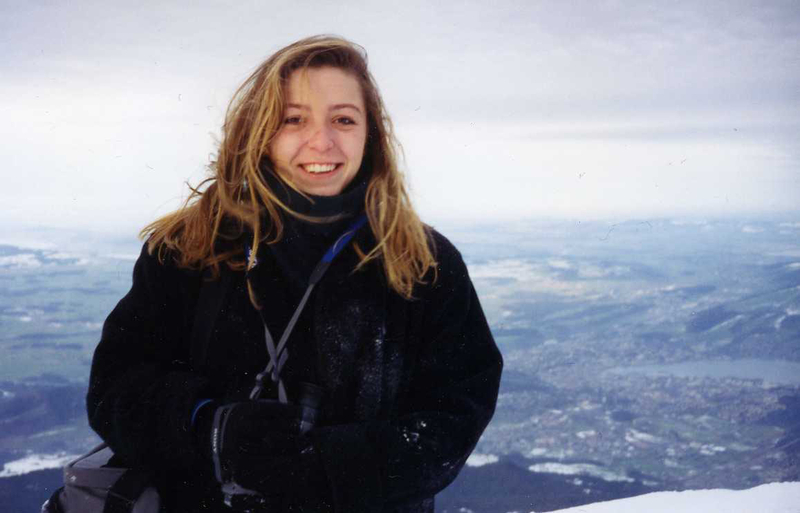 They’re just as strong as 10, or even 22 years ago, when I took this photo of her on the top of a Swiss mountain. Miss you Sarah, now and forever. Art, I love this loving look at such a hard thing to bear. Grateful that you can see, metaphorically like the sun and moon both visible in the sky at the same time, the lightness of “her laugh, her energy, her smile, her intensity, drama and charisma” and the dark despair of her challenges and her loss. i like your metaphor Anne – the sun and the moon. i wish i’d thought of that! thanks. The Author of this poem is unknown, but a friend of mine sent this to me in a time of great grief; of all the things that have been written, this to me is the most fitting. We have never met, but I share this with you in the name of eternal love.